If you’re on a budget but want to find awesome ways to organize your house and make it look great, then I suggest checking out the dollar store. Doesn’t sound so great, I know, but trust me with this one. People all over the internet have been finding ways to take ordinary products and appliances and turn them into something more. Something that looks amazing. Now down below, I’ve found some great ideas from bloggers lists of dollar store organizing ideas. I love getting tips from lists and sharing them with my readers, because not only do they get to see my chosen hacks, but they also get to click through the link to a whole new list with new ideas! It’s a great way to spread the love and give you guys even more inspiration! Want some awesome storage that looks chic, but super cheap? 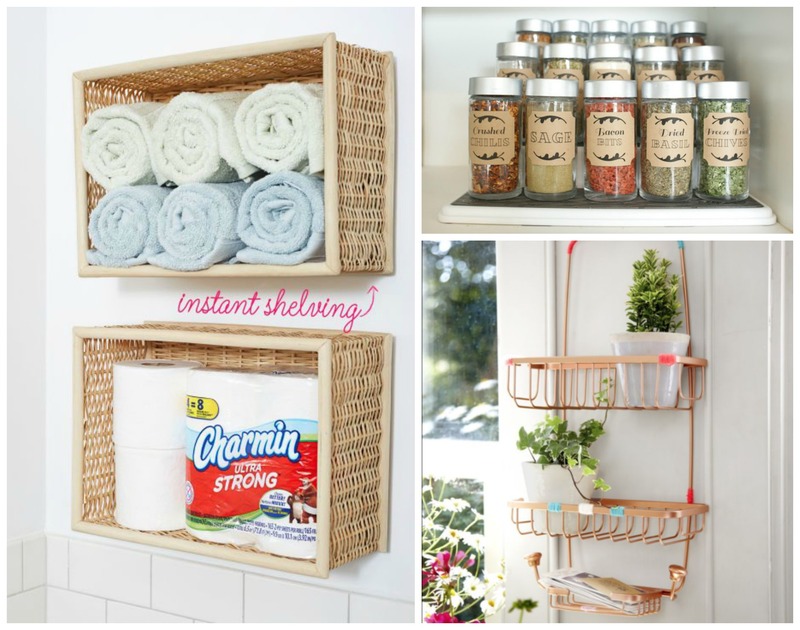 Get some wicker baskets from the dollar store, put them on your walls, and store your towels in them (or whatever the heck you want to store). Super simple right? Cutting boards are thin enough to store in this wire basket, and it opens up a whole lot of space for bulkier items. If your freezer is over crowded, then buying simple baskets from the Dollar Store will be a colorful way to organize it and keep it clutter free. Passion for Savings found some awesome spice organization ideas (with free printables for labeling). Can your cupboard get any more fancy than that? I know I’ve already shown you some storage bin ideas, but this one is great. It’s an awesome way to take something so simple and plain and turn it into something that makes your space look chic. Spray paint guys, that’s all it takes to make this shower caddy become your new mail holder so that your mail doesn’t become piled up on your counters. Also, it just looks plain awesome. I love this list of things you should buy at the Dollar Tree. It just shows you that you don’t have to spend a lot of money at the regular store for necessities. And as for storage, you can buy Hefty bags for just a dollar, and keep items you don’t want cluttering the house in the garage. Now here’s the last list of things you should buy at the dollar store. It may not have storage ideas, but it’s definitely a list to check out since it’ll help you save some money. Also, with all of those storage bins you just bought, you’ll need something to put in them (I’m just joking guys, I do not promote the idea of buying stuff just because). Now whether your home has gotten a little too cluttered or you want to decorate it on the cheap, the dollar store is a great place to go. There’s no need to spend a lot of money at conventional stores when you could make your favorite spaces look chic on a dime. Also, there are plenty of dollar store DIY ideas out there, so you have no excuse not to save money when organizing and restyling your home. Now if you have any Dollar Store finds yourself, let me know down below in the down comments! I’d love to hear about them! I always buy bread at the dollar tree. Our store always have name nrands like Natures Own. Its at least $2.00 a loaf at grocery stores. Storage for washcloths considering width and bread is only .89 cents Walmart.